Select Your Week/s:* You pick and choose which weeks work for you! Select Your Week/s: You pick and choose which weeks work for you! A $35 non-refundable registration fee per child applies as part of this registration. If you are paying by card a 3% processing fee will apply. 5% Sibling Discount for 2nd child registered and any additional children. Please download and print the medical consent form for all children attending camp as well as the trip permission form for all Gan Izzy campers. These can be found under "PDF Registration Form" link. Registration Fee It's Waived! Only for Black Friday! I am signing up my child/ren for Camp Gan Israel (CGI). I give my child/ren permission to attend all trips and receive medical care in the case of emergency, G-d forbid. I permit CGI to drive my child/ren to and from trips. 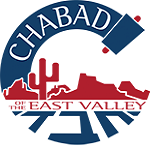 I permit CGI and Chabad of the East Valley to publish photos of my child/ren on the CGI/Chabad website, Facebook and Instagram pages, and in other promotional brochures and videos for the purpose of promoting CGI and Chabad. Before/After Care Request Please submit the days/times that you will need extended care. We will be in touch to discuss pricing and availability. Were you referred by someone? Write their name and they'll get a $100 discount!